The only surviving contemporary manuscript of Blind Harry's epic poem about the life and deeds of Sir William Wallace, Guardian of Scotland and great opponent of Edward I of England. The poem created an enduring image of Wallace as the heroic national liberator - an image perpetuated in the recent film Braveheart. The poem was composed between 1474 and 1479, some 170 years after Wallace's death. Its author was probably a professional bard known as Blind Harry or Henry the Minstrel, and it draws heavily on traditional tales and legends about the great Scots hero. 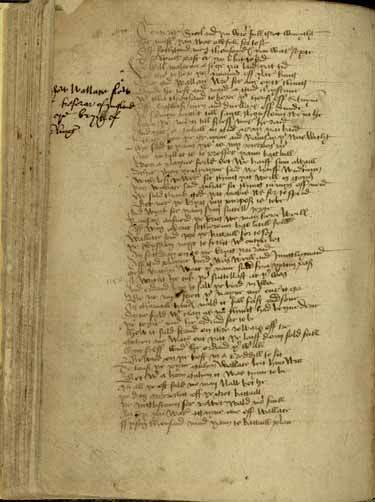 This manuscript copy was written in 1488 by Prior John Ramsay of Perth. The marginal note reads 'How Wallace slew [the] tresorar of Ingland [at] the bryig of [Ste]rling' - a reference to Wallace's great victory over the English at Stirling Bridge. A measure of the poem's importance is that after printed editions of it began to appear around 1508, it went through more editions than any other book before the times of Burns and Scott.